Everyone needs the support, especially in the hard times. The true friends help us to keep the lights on and stay on the path that we have chosen. 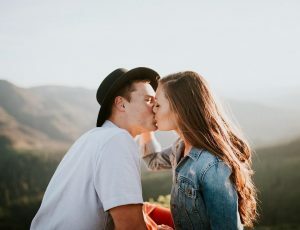 They make it easily, just by their presence in our lives and by giving us their love – yes, they love us in their special way; love of a girlfriend is a bit different, but the love of a best friend is of the same strength. Long friendship does not exhaust these feelings, they become even more tighten with the time. If you meet a good person at a school period and succeeded to keep the good relationships with this person till the graduation from the university – be sure that you will be friends for all your life, as this period is meant to be really difficult – you develop your personality. Thus, your friend will know your background, your “foundation”, and will help you to build the walls of your character’s house. You should help him or her to build own beautiful house – and there is no matter where this building will be located, either near you or far away. We know the cases of total destruction of the close friendship, that supposed to live forever. You should remember that there is the possibility to hurt your best friend at ease, even if you think that he or she is able to understand everything in the world, starting with you. Do not be so egoistic to believe that you are fantastic as hell and everyone must pay attention to your personal things; no one will want to be a friend of yours with such an approach to the relationships, so even if you managed to get several good persons in your inner circle, you can lose them all with your stupid ignorance. Do not want to stay alone? Take care of your friends! Talk with them, go for a walk with them, give attention to them. Even a little detail like a cute message in a morning is important. 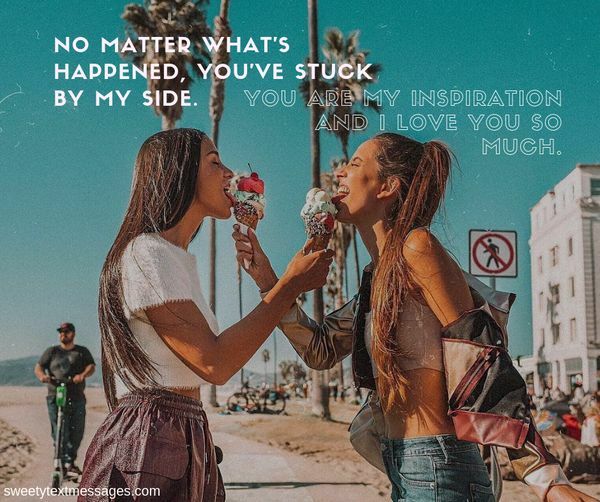 We will help you to maintain the contact with your soulmates with this wonderful collection of bff messages! What if you need a friend and there are hundred steps between us? 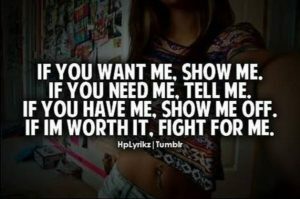 You can take the first step to get near me and I will take all 99 steps to be there for you. As best friends, we have had so many good times together and we will remember and cherish these memories. And whatever life changes come, one thing’s sure – we are friends forever. Our friendship is like a circle. Do you want to know why? A circle has no ends and so does our friendship. My dear friend, we have had a lot of fights and disagreements, there have been the rough and bumpy roads which we passed. But I know only one thing – our journey together will never stop. You are my friend till the end of my days. Buddy, we are indeed best friends. Because I can be sure that you are the only person in this world who will never let me do stupid things… Alone, of course. Bestie, I hope you know that you are the reason I smile when I look at my phone and see a notification about a message from you. Why so? Because you always send me something cool and funny. Your friendship is a greatest gift the life presented me with. And I promise that I will always cherish this wonderful friendship in my heart! Being my best friend is a title that only you deserve to have. Besides the cap fits you perfectly. They say a true friend is a person who can understand anything you say. For me it’s a person who understands you without a word. It’s nice that we can understand each other’s silence. Thanks for knowing exactly when to tell me what I want to hear, when I want to hear it the most. Even though we’ve both changed a lot over the years, I still feel that I am as close to you as ever. Today I sit here remembering the fun times that we’ve had. As the years have gone by, I realize today that you have been the only person in my life who bonded with me without any expectation. How can I ever thank you? Back at school times my mom always asked me, “If all of your friends jumped off a bridge, would you jump with them?” And my answer was, “I would be at the bottom to catch them”. Since then nothing has changed, my dear friend. New isn’t always better and sweeter. True friendship has to be tested by time. Thanks to you I know that it’s possible to become friends at school and to remain friends throughout life. Do you remember when we were at school, we liked dreaming and talking the future? And here we are now living the future. It has been an interesting journey and I am happy that I was lucky to share it with you. Thank you, my lovely friend. In the darkness of life, you, my friend, are the guiding light that shows the way when I don’t know where to go to. A true friend enlightens the entire life. Thanks for being the “brightest light” of my life. It’s thought that one of two friends has the bad influence on the other. But when it comes to our friendship, I can’t even remember which one of us is the bad influence since we’ve been friends for so long. I can’t understand why people visit any therapists. The friend’s house is the best place you can go to when you need someone to talk to. These friendly heart-to heart chats over a cup of tea are everything I need to get better. My school friends have taught me that true friends give and expect nothing in return. Since school I know that no matter what life brings our way, I have you and you have me, my dear friend. You are so unique and you see the world in a special way. I’m glad to have you as a friend. You are the kind of friend that life needs to give everybody, so that even they understand how beautiful life can really be. No one else gets me quite like you do. You’re awesome. Girl, when you feel down, keep in mind that I’ll be there to cheer you up. And when you are tired, I’ll be the first one to lift you up. You are my friend no matter what! My dear friend, the only comfort zone for me is being with you. Your love and support help me keep fighting and believe in a better future. If it wasn’t for you, my friend, I wouldn’t have become the person I am today. You have always believed in me and this made me a confident person. Everything I am and will be is because of you, my sweet friend. If there was a prize for the perfect friendship, I’d give it to you because I can’t think of a better friend. Want it or not, you and me will be friends forever because you already know too much. Every time I feel like everything is going wrong and can’t pull myself together, there’s only one place I always go to – and this place is your home. 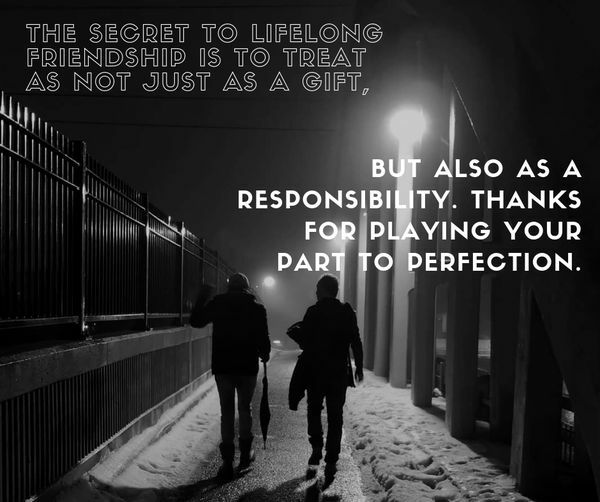 Your friendship makes things right. They say, ‘A friend in need is a friend indeed’. 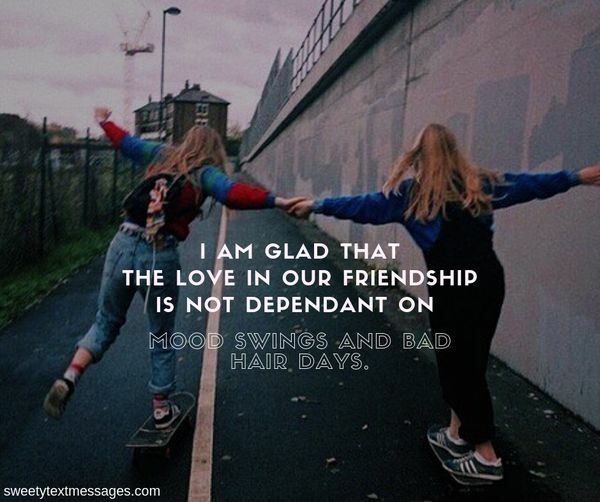 It’s definitely true, but I am so happy to have a friend like you who shares the good times with me as well. I appreciate your constant support, help and trust. You are truly the best friend a person can ask for. Thank you so much. In the cookie of life, friends r the chocolate chips that make life sweet, surprising and yummy. Thanks for being one of the yummy choc chip of my life. I am glad that the love in our friendship is not dependant on mood swings and bad hair days. From the moment we met, I knew that we were going to be fast friends. I’m so glad I was right. Friendship teaches us that even though people are different, we have to respect these differences in one another. It’s great that I have a friend like you who accepts and respects me the way I am. To my bestie who is my world, my everything. If my life was a ship, you would be my anchor. I love you a lot. For me a friend is someone I can be comfortable with, someone I can be myself with. I have all that in you and I am so happy about it. You mean the world to me, my wonderful friend. Ever since we have met each other, my life has become more interesting and beautiful. You are my best friend forever. It is great to have somebody who is like you and not like you at the same time. You are my BFF. How do people tell a friend from an acquaintance? They both can feel your mood, but when it comes to friends, they always look much deeper. A true friend always knows the reason for your sadness or happiness. He loves you even when you forget to love yourself. People are not perfect, each of us has drawbacks, but a real friend knows that and so they will never make fun of it. On the contrary, a true friend will tell do his best to let the whole world know how awesome you are. The best friend is someone who sticks closer than a brother or a sister. I am glad to know that I have you because you are more family than a friend. 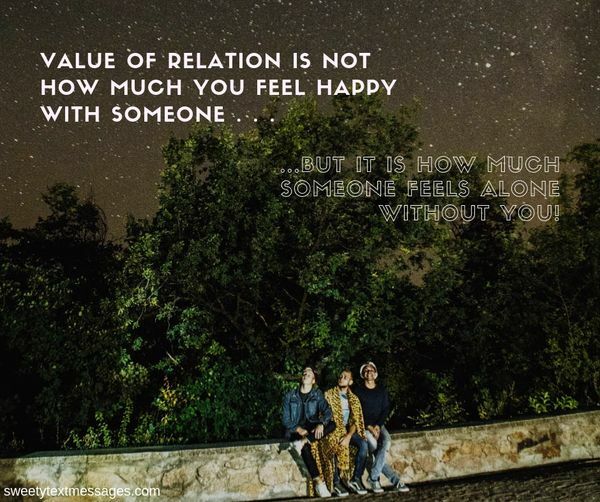 Value of relation is not that how much you feel happy with someone . . But it is that how much someone feels ALONE without you! If there weren’t friends, life would be awful and ugly. Luckily, we have each other, bestie. My sweet friend, even the whole world is against me, I can be sure that you have my back. I have no doubts that we are going to be friends forever because, let’s face it, we are way too lazy to find new friends. Just kidding. Luv ya! We are best friends. Please remember that if you fall, I will help you to get up… after I finish posting the video on YouTube. We have to be careful while choosing friends. But we will never find out how to choose best friends, because they are the angels sent to us from heaven. n everyone else turned their back on me, you were the only person who didn’t. Thank you for always being there for me. I’m promising I will never ever let you down. One of the best things about having good old friends is that you can be as stupid with them as you want. Friendship can be compared to a tree. No matter how tall this tree, what really matters is how deep the roots of the tree go. Thank you for texting me and keeping up with me more thoroughly than my significant others have. Everyone knows that sharing is caring. In case of friendship it is about sharing everything: from happiness and sorrows to home and food. 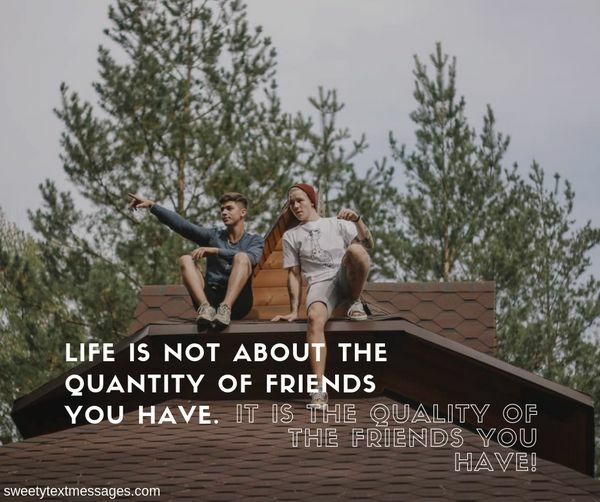 That’s why friendship is so unique and pleasant. Only a true friend can see the pain in your heart when everyone else only sees a fake smile on your face. Thanks for being a true friend for me. A friend is a person who doesn’t judge your past, have faith in you and your future, and can accept you just the way you are. The best thing about having good friends is that even if you don’t have lots of money or valuable possessions, they will always be by your side. My sweet friend, thank you for being such a great friend for me. Do you know why do we really need friends? Who else will tell you how awful your ex’s new girlfriend looks? If I had to choose between winning a fortune or finding a true friendship, I’d choose the money, of course, because I already have the best friend on earth. Besides, we could spend this money on stupid things together. My friends are my blessings and you are my biggest blessing. Thank you for being such a good friend for me. My friends make the best company, they start the most interesting conversations, thanks to them my life is so exciting. Sometimes my boyfriend/girlfriend complains that I spend too much time with you, but I just can’t help it. After all, we are BFFs! Thanks for sticking by me all these years, buddy. How long shall v b friends? Do u want a clue? As long as stars twinkle in the sky, till the water runs dry & till the day I die. We will be friends. Even if I have 99 problems in my life, I wouldn’t mind because a true friend who is always there for me. We have been best friends for so long that we don’t even say a word to understand each other’s thoughts. No money in the world can buy a true friendship. Do you want to know how I know that? Because even though I’m broke, you are still my friend. Sometimes I imagine my life with no friends in it and all I can see is darkness. My dear friend, thank you for bringing light to my life. Sorry, but I can’t promise that I’ll be your friend forever because people aren’t immortal. But I can promise to be your friend as long as I live. My dear friend, you are the inexhaustible source of that smile on my face. We can be miles away from each other, but it seems that you are closer to me than my family members with whom I live in the same house. Good friends are like good books. No matter how many times you have read them, you want to reread over and over again. Not a day goes by that I don’t think about how much your friendship means to me. 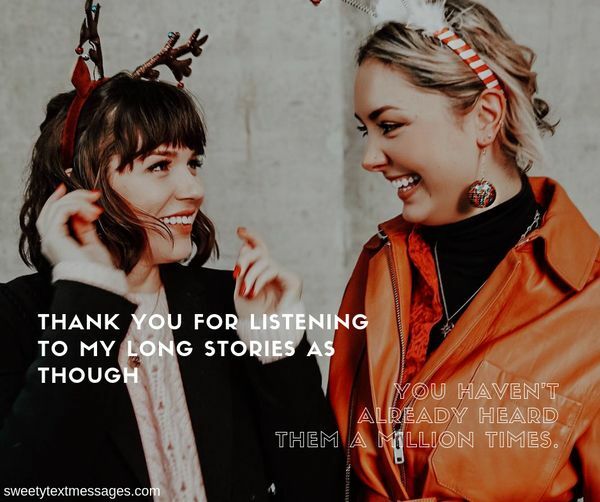 Thank you for listening to my long stories as though you haven’t already heard them a million times. There is no such thing as coincidence! People met for a special reason. But whatever it is, I’m so glad I have you in my life! Clueless? Oh, come on! Let’s just say that we are meant to befriend. If I had a chance to make only one wish, I’d like everyone in the world to have a friend like you. The world would have become a better place. My lovely friend, you are a gem. The best friends don’t necessarily have to be alike. They just need to understand each other and the differences they have. My friend, thank you for always bringing smile to my face. Thank you for always seeing only the good in me. Mutual understanding is one of the most beautiful qualities of true friendship. I am happy to have a friend who really understands me like no one else can. 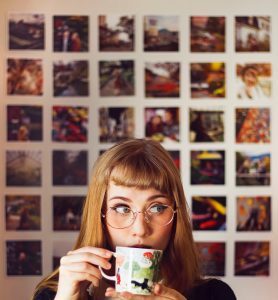 Sitting and chatting for hours over a cup of coffee with you, my friend, is pretty much my favorite way to relax. I’d like to say ‘thank you’ for all those conversations we had. You are the only person in this world with whom I can share my tears and sorrows. Even if you aren’t with me, I know that I can always count on you. My dear friend, thanks for being by my side. Do you know what kind of a friend are you? 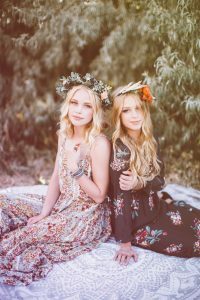 The friends like you should be given to everyone on this planet, so people could find out how beautiful the life with true friends can really be. I am not afraid of challenges my life can give me, because I have you, my friend. Together we can make anything happen. Can’t stop loving you. I would rather thank you time and again for being a wonderful friend in every way, than belittle our friendship by saying thanks only once a year on Friendship’s Day. Thank you. 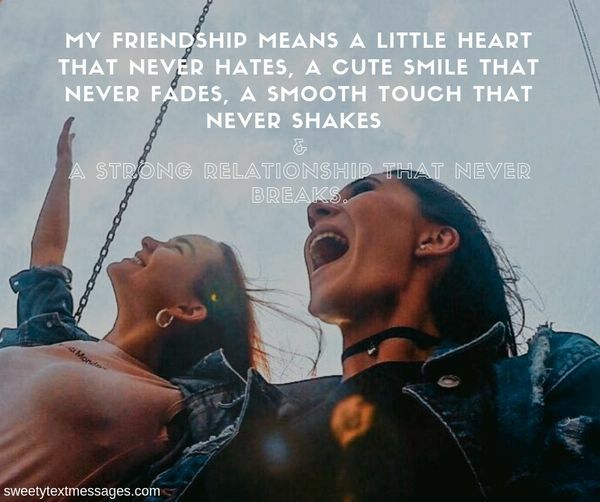 My Friendship means a little heart that never hates, a cute smile that never fades, a smooth touch that never shakes & a strong relationship that never breaks. A true friend isn’t the one who tells sweet lies just to be nice. A true friend is the one who tells you bitter truths in your face instead of behind your back. There have been a lot of ups and downs throughout our friendship, but they only made us better friends. Remember, no matter what life prepares for us, I’ll be there by your side, friend. The greatest advantage of true friendship is that one friend can talk total nonsense and the other understands it. Some people go to therapists to talk about their problems, others go to priests. I don’t have to go to any of them, because I have my friends. It is really important to remember and care about our closest people not only while we can be together, but also when miles separate us. Distance tests the strength of friendship and I am glad to have friends who are close to me even though we aren’t next to each other right now. True friends love is unconditional. I love you unconditionally, my friend. That’s true. Sometimes, when emotions get in the way of telling how I feel about you, my friend, it seems impossible to find the right words. But I know that you can understand me without a word. When you tell me the bitter truth, I know that you do that not to offend me or let me down. I know that you do this to show me the right way. Thank you for touching my life in ways you may never know. my riches do not lie in material wealth but in having friends like you – a precious gift from God! 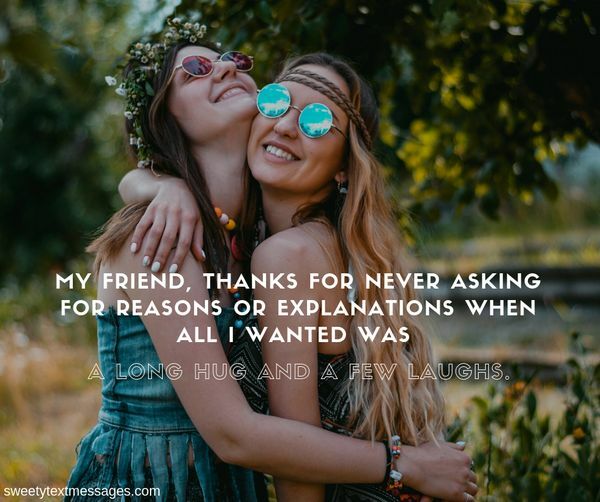 My friend, thanks for never asking for reasons or explanations when all I wanted was a long hug and a few laughs. I want to become a successful person so I can share the joys, happiness, and riches of life with family and friends like you. You are my motivation; you are my inspiration. Thanks! Our friendship is one in a million, no, one in a billion, no… It’s one of a kind. Thanks for being my one and only true friend. A friend like you is my source of joy and inspiration. I’m so glad I have you! Friends may have quarrels and misunderstandings, but they always know the way to work the things out. I can be sure that whatever quarrels we have, they will only make our friendship stronger. Being a Best Friend is not just telling jokes, having fun or drinking a cup of coffee together. It means being there for each other, sharing each other’s sorrows and helping each other. 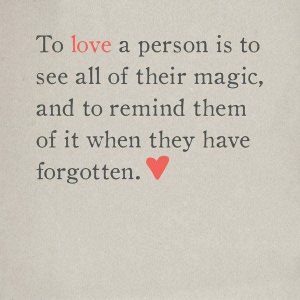 I may not say too often, but I want you to know that you are a really special person to me. You are my friend, my light in the darkest night. I love you my dear friend and I hope you love me as much. Some people believe that success is what makes our lives complete, others find joy in money. There are people who can’t imagine their life without their career. I believe that the true happiness is in friends. My friend, you’re one of a few people whom I want to see every single day, because you make my days brighter.